Introduce your students to fractions with this simple fraction game. 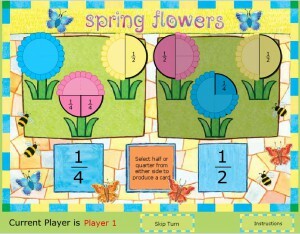 The objective of the game is to fill up three flowers that were split into fractions with actual petals. 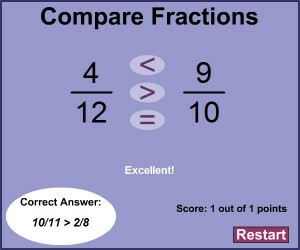 To do this, the players are asked to pick one of the two fraction cards that are displayed at the bottom of the screen. The game then produces a corresponding petal card with a random color, which the players are then asked to match to one of their flowers. If the fraction card or the color the player needs is not listed on screen, he will have to skip his turn. The first player to fill his flower bed with flowers wins. The game has a two player mode for team play, and the teacher also has two difficulty options. Try it out! 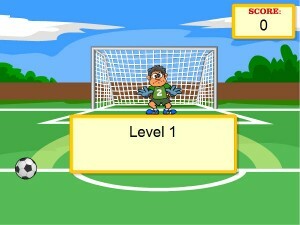 Dividing Fractions Game is another fun and interactive soccer math game that you can play online. In order to kick the ball and score points, you first have to answer math problems correctly..
For revising greater, less or euqal than fractions. Divide your class into teams and let each write down the answer they think is right. The teacher then shows them the correct answer on the board.